Time for another diverse selection of books to share with you. I have just read my first book for tweens. If you visit here much you know I don’t have children, but I’ve begun to expand my reading to younger selections in order to recommend books for my cousins. I want to pass my love of books on to them. 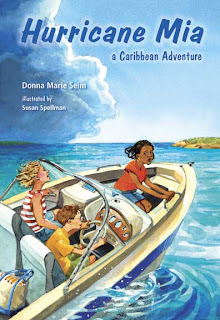 Twelve-year-old Mia and her younger brother, Jack, have been sent to spend the summer with their grandparents in the Caribbean. Sounds like a wonderful vacation, but not to Mia. Mia wants to be home in Boston with her mother and father and her dog, Rags; as well as her best friend, Sam. But Mia’s mother is sick with leukemia and thought it was best for them to spend the summer away. Mia doesn’t get along with her grandmother and her grandfather spends all his time with Jack. There’s no cell phone service on the island and she can’t use the phone often because of the expense. Mia makes friends with an island girl about her age, Neisha. From Neisha, Mia learns of a special tea “that cures everything.” Desperate to help her mother, Mia talks Jack and Neisha into taking her grandfather’s boat and going to a nearby island to see the woman who makes the tea. The group encounters a number of problems along the way including a tropical storm, bats, barracudas, and losing the boat. Mia is your typical tween who doesn’t like to do what she’s told and sometimes that leads to dangerous consequences. HURRICAN MIA teaches youngsters about friends, family, and responsibilities. The illustrations by Susan Spellman add to the story. In addition, there is a study guide, game activities, party ideas and a glossary in the back of the book. The book is suggested for youngsters ages 8 to 12 years old. FTC Full Disclosure - I requested this book and it was sent to me by the author in hopes I would review it. However, receiving the complimentary copy did not influence my review. This is not a typical book I would read because it deals with giving advice to fiction writers. But since writing is writing, I decided to give it a look. It’s jam packed with great tips for getting one’s imagination and writing energy flowing. Author Susannah Raulino gives 21 exercises that writers can use when their muse has left them or they just need a little extra confidence with what they’re writing. 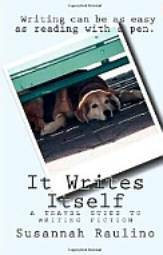 The book is designed to help both the inexperienced, as well as the professional writer. One of the exercises is to write down 30 reasons why you write. Some of the reasons listed as an example are: to entertain, to warn, to remember, to evoke emotions. This is done to get the writer thinking. This delightful cookbook will make a nice addition to anyone’s kitchen collection. The recipes are inexpensive and easy to prepare. The recipes are designed for cooks of all levels of expertise. Author Denise Burroughs combines her Italian heritage with family tradition recipes to create a handy and helpful debut cookbook. Some of the recipes include: Sloppiest Sloppy Joe, Aloha Calzone, Cheeseburger Casserole, Hornets Nest Cake and Funnel Cake just to name a few. In addition to the yummy recipes, the cookbook is filled with kitchen tips, baking tips, and baking substitutions. FTC Full Disclosure - This book was sent to me by the author in hopes I would review it. However, receiving the complimentary copy did not influence my review. Hurricane Mia is something I would have loved reading when I was that age. And I just adored that quote about what makes you a writer and a good writer. Thanks Mason, I love the look of the writing book and may add it to my TBR pile! I like that title, A Travel Guide To Writing Fiction. The writing process does often feel like an actual journey, so what an appropriate title. Great list! That fiction writing book looks particularly interesting. Sounds like a book with substantial lessons and extras that would be helpful to parents. This sounds like a great book for kids - action and adventure along with a story of friendship.